Similar to schools in other states, colleges in Iowa vary greatly based on their educational offerings and target demographic. While traditional four-year schools are represented, many technical schools and career training centers also exist in the state. While local universities mostly focus on students who hope to earn Bachelor's degrees or advanced degrees, community colleges, technical schools and non-accredited business schools offer everything from two-year associate degrees to career certificates and diplomas. No matter what type of education you're after, you will be able to find it in Iowa. Fortunately, many Iowa residents have already taken advantage of the wealth of educational options in the state. According to a 2014 report from the NCES, federal financial aid-eligible colleges and universities in Iowa granted 85,376 degrees and certificates to 82,137 graduating students during the 2011-12 school year. Among those students. 77 percent earned degrees at four-year institutions and almost 23 percent earned two-year degrees. Meanwhile, only 58 students earned certificates from less-than-two-year institutions that year. In addition to traditional on-campus education, institutions for higher learning in Iowa offer a wealth of online and hybrid degree programs designed for busy students. These programs typically offer coursework that can be completed anywhere with an internet connection and during flexible hours including evenings and weekends. Although online education in Iowa remains a popular option for nearly any type of student, these programs can be especially advantageous to those who need to continue working full-time during school, busy parents, or anyone who lives far away from their ideal college campus. Although some online degree programs are ranked by U.S. News & World Report and other college rankings, it's important to note that not all are. In fact, many online and hybrid degree programs offered by two-year schools are not considered for rankings, even though they offer excellent instruction in high demand fields. Before you select an online degree program, conduct your own research to determine quality of instruction and overall flexibility. Due to increased diversity and the spread of languages other than English in the United States, the demand for bilingual professionals is on the rise. That is especially true when it comes to workers who provide translation and interpretation services. According to the BLS, employment for interpreters and translators in Iowa could increase by as much as 48 percent during the decade leading up to 2022 -- that's more than four times as fast as all occupations combined. According to the BLS, a number of degrees can put you on a path towards a career as an interpreter or translator. However, the most popular degree options for these workers are Bachelor's degrees in English or a Foreign Language. Coursework can include everything from cultural studies to traditional literature and language use. An internship abroad may also be especially helpful. Because of the demand for sonography in the quest for disease and injury diagnosis, job openings for diagnostic medical sonographers in Iowa are expected to increase substantially. Specifically, the U.S. Department of Labor predicts that employment for these workers will increase 45 percent in Iowa from 2012 to 2022. The fact that you can begin this career with an associate degree also increases its popularity among those who desire quick entry into the workforce. According to the BLS, most diagnostic medical sonographers begin their career by earning an associate degree in Diagnostic Medical Sonography. However, a certain percentage of students earns a Bachelor's degree. Courses to focus on include anatomy and physiology, biology and other courses in health and science related disciplines. Demand for health care services remains high in Iowa, and part of that demand includes the need for occupational therapy. Because of the demand, the U.S. Department of Labor predicts that employment for occupational therapy assistants in Iowa could surge by as much as 44 percent from 2012 to 2022. Since earning an associate degree in Occupational Therapy Assisting only takes two years, this career remains popular among those who don't want to spend four full years in school. As the BLS notes, most occupational therapy assistants get their start by earning an associate degree from an accredited Occupational Therapy Assisting program. These programs usually include a combination of classroom instruction and fieldwork. Coursework usually includes psychology, biology, anatomy and physiology and additional training and health and science related disciplines. Jobs in computer technology remain in demand all over the country, and Iowa is no exception. Since information security analysts help businesses protect their valuable networks, jobs in this field are experiencing exceptional demand. According to U.S. Department of Labor figures, employment for information security analysts is expected to surge 44 percent in Iowa from 2012 to 2022. As the BLS notes, most information security analysts begin their careers with a Bachelor's degree in a computer-related field. Bachelor's degrees in Computer Science and Computer Programming are two of the most popular options. For advanced positions, some employers prefer to hire information security analysts who also have a Master's in Business Administration, or MBA. A wide range of factors contribute to the rise in the demand for actuaries with each passing year. However, the growth in the demand for health care in Iowa appears to play a huge role in the growth for this occupation. As the health care sector grows, more and more actuaries are needed to calculate complex formulas and insurance rating systems. In the state of Iowa, this means that employment for actuaries could increase by as much as 39 percent from 2012 to 2022. Most actuaries get started with a Bachelor's degree in Mathematics, Actuarial Science, Statistics, or any other Analytical field. In most cases, undergrad coursework includes classes on economics, applied statistics and finance. In addition to earning a degree, most actuaries also need to earn a professional license or designation. In most cases, those certificates are granted from either the Casualty Actuarial Society (CAS) or the Society of Actuaries (SOA). While a degree is not a guarantee of a job after graduation, these top careers, and others, may offer greater potential than most. Before choosing a degree program, it makes sense to conduct some research on your own. Finding out whether or not your future career could be in demand - and what average salaries look like - could help you narrow down your options. 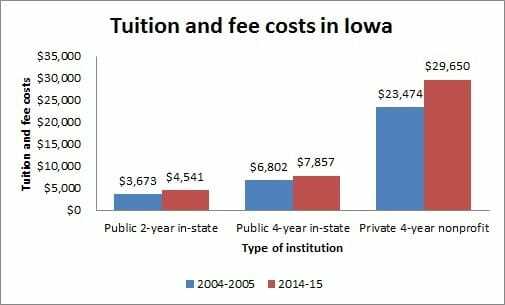 Although it's easy to find average tuition statistics for colleges in Iowa, it's important to note that tuition and fees vary widely from school to school. When you begin searching for a degree program, make sure to take note of any tuition information you can find. A huge price difference among schools is extremely common. Still, looking at averages can help you get a general idea. A 2014 report published by the College Board shows just how much the average cost of college has changed between 2004 and 2014. Although college tuition can seem sky high, it's important to note that, in many cases, financial aid is available. Typically, your first step towards securing financial aid is filling out a FAFSA form - or free application for federal student aid. This form can help state and government agencies determine what type of aid you might be eligible for, and how much. Students in Iowa also have plenty resources to turn to when it comes to finding out about scholarships, grants, and other forms of student aid. The Iowa College Student Aid Commission, for example, offers all sorts of information on current scholarships and grants, and how to apply. Other resources they offer include information on various student loans and repayment, loan forgiveness programs and up-to-date tuition data. To learn more about Iowa financial aid, contact the Iowa College Student Aid Commission and the appropriate state and federal agencies. You can also contact colleges and universities in Iowa to see if any school-specific aid may be available. To find out more about some of the schools and programs available in Iowa, be sure to check out the ones featured in our school listings below. Note: This list also contains online schools that accept students from this state.